It was 1851, and the great Unitarian minister Theodore Parker decided he needed a gun. The 1850s were a tumultuous time for our country, a time of stark divisions, a time where to be black was to be endangered, and a time where white people were waking up – some white people, some realizing they could no longer simply stay silent. This was the reason for the 1850 Fugitive Slave Act – to try to stop these shifting sands – it was a law meant to force the north to cooperate with slavery. It made it illegal for someone to know about an escaped slave and fail to ensure their return. I imagine it not too different than what it would be like today, if there was a law that made it so that if any of us knew about someone who was undocumented, but didn’t report them to the authorities, then we would be detained. It would be a terrible moral dilemma. And it feels especially terrible to imagine this version playing out today, because it feels not completely impossible. Northerners who had before simply tried not to think about slavery were forced to figure out what they thought, and to decide officially what side they were on. Would they risk their own security and freedom – or more explicitly cooperate with what most knew was an evil practice with generational consequences? Many felt the Fugitive Slave Act was their worst nightmare. And also, as we know, sometimes, the worst thing makes possible the beginnings of real change. Theodore Parker’s activism was already in full force before 1851 – he’d spent his life on the leading edge of religious, moral, and social transformation. He is the one who said: “I do not pretend to understand the moral universe; the arc is a long one; but from what I can see, it bends towards justice.” Parker had a large and integrated congregation that included free black men, and fugitive slaves. There was no way he was going to comply with the Fugitive Slave Act – it would mean failing to do his part in bending the moral arc. Instead, Parker opened his home to fugitive slaves, and protected them, all the while continuing to preach abolition from his pulpit. Which is why he had been, as he says, obliged to arm himself, keeping a gun in his desk, on the ready. I wonder what it felt like, to write those sermons with the gun, so nearby. How it shifted his sense of urgency, how it clarified, or challenged his commitment, how it changed him, his faith, his life. There was nothing abstract about the risk of his ministry. It was – right there, tangible, intentional, life-threatening. This is the power of a gun, that it is not only about a gun. A gun is also about power, shame, ego, fear, control, pain. A gun is an act of performance, sometimes sport, survival, sometimes rage. When we talk about guns we are not just talking about guns –we are talking about poverty, class, capitalism, racism, domestic violence, patriarchy, mental illness, health care. We are talking about children, parents, communities, elders. We are talking about our country, our understandings of ourselves. 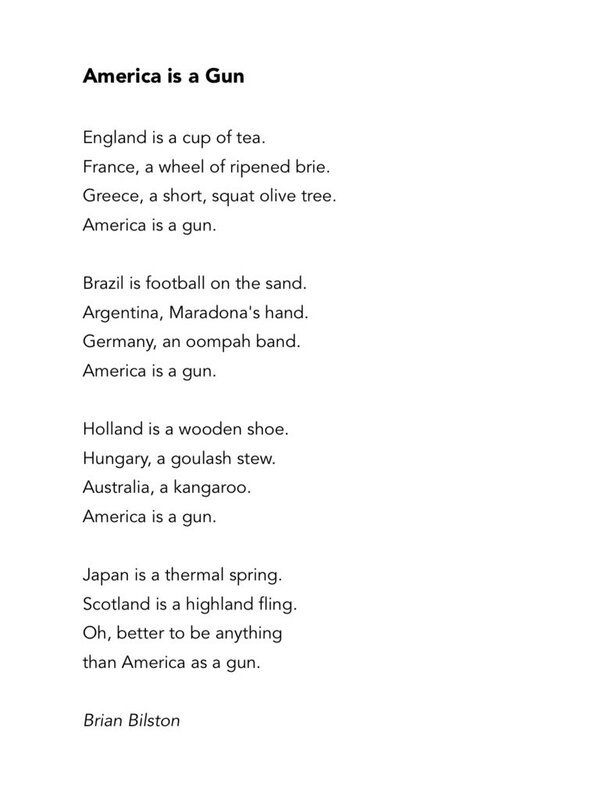 When we are talking about guns, we are talking about us. There are more than 350 million guns currently in circulation in the US – that means about 120 guns for every 100 people. On an average day, 96 people in the US are killed by guns. Every week, 136 children and teenagers are shot. More than 30 Americans are murdered by a gun, every day. About 15 of the 30 of these are black men. More than 135,000 students in the US have lived through a school shooting in the last 20 years. Mass shootings are not, however, the biggest threat from guns. Suicide is. Having access to a gun makes it much more likely that someone just “thinking about suicide” will complete it. Violence is a deeply embedded part of our cultural identity. We live in a culture permeated by guns, they are everywhere, so much they can start to be invisible, assumed, the natural order. And, at least if you talk to the so-called second amendment people today, that is how they think about the individual’s right to own a gun. Like it’s a human right. Or at least, a right authorized by the US Constitution as it was originally intended by James Madison. The story of the second amendment, is however, more complicated than this – in that it has not always been entirely clear-cut, or agreed – even among conservatives – that it was intended to secure the individual’s right to bear arms. Growing up, I learned about this amendment in school – along with the other ones. The second amendment lesson was like: that was written when we were pretty new as a country, we needed militia, so we needed to clarify that – but it doesn’t really apply. We keep it around because we don’t want our numbering to get off. If you were in school in the 1980s or before, you would’ve likely learned the same thing. But that is not – we know – how the 2nd amendment is talked about today. Today, this amendment has nothing to do with the militia, and everything to do with the individual’s right to a gun. Question: What new Governor of California in 1967 said these words: “There is absolutely no reason why out on a street today a civilian should be carrying a loaded weapon.” ? And one more trivia question: What candidate for President – the first Presidential candidate endorsed by the NRA by the way – said in 1980, “The constitution says the right of the people to keep and bear arms shall not be infringed.” ? It is not a coincidence that Reagan’s shift in thinking parallels the shift in the wider US in those same years – because the shift begins in the context of that statement he made in 67. Reagan was at the forefront of gun control efforts – because he wanted specifically to stop the efforts of the newly formed Black Panther Party for Self-Defense. The Black Panther Party for self-defense – not to be confused with, nor entirely separated from the Black Panther comic and movie franchise – was a political organization founded by Bobby Seale and Huey Newton in 1966 to monitor and hold accountable the Oakland Police Department – to police the police. Newton was a law student, and he’d studied the 2nd amendment, along with state laws, and he was brilliant. So he figured out that there was no legal reason they could not show up in public, for example, in front of the state house as they were deciding about gun control laws, with shotguns. Which is what they did. Newton, and Seal, and 28 other members of the Black Panther Party lined up at the state house in Sacramento with 24 loaded guns. .357 Magnums, 12-gauge shotguns, .45 caliber pistols. And some of the first gun control laws in the country are passed in California. With bi-partisan support – making it illegal to carry loaded weapons in public. Because guns – are never just about guns. Guns are about power – who has it, who doesn’t, who hopes to gain power. And guns are about the story we tell ourselves about that power, and its righteousness. The holder of the gun is the protagonist, the hero. Or they are the villain, the criminal. 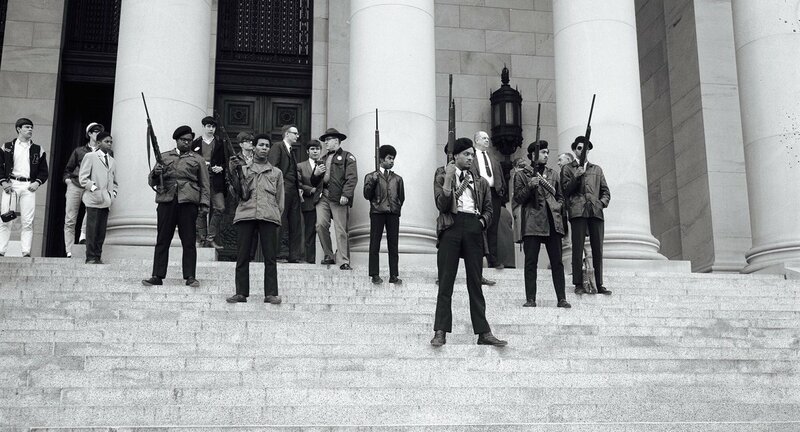 Black men lining up holding shot guns on the state capital, even if they are doing nothing more than standing, watching. We know what role the American idea would cast them in. On the other hand. While the California politicians were writing these gun laws to prevent black men from turning up in public with shot guns, white folks were paying attention. During the 2016 campaign season, the NRA spent about $419 million on lobbying. Colorado’s Senator Gardner received nearly $4 million of that. There was a time when Colorado seemed to be the best hope for new leadership in the conversation around guns. We have every reason, every heartbreak to fuel bold and courageous leadership. Next April will mark the 20 year anniversary of the day 2 high school students in Littleton opened fire on their fellow students and teachers, killing 12 and injuring 21 others. They also took their own lives. I don’t know if any of you – like me – have personal connections, or nearly, with people present on that day. What I know for sure is that day changed everything. For everyone there. No student, no teacher, no staff – no one went on to live the life they thought they were going to live. Everything changed. Or, at least, it seemed like it did. There was outrage, dialogue, spreading across the country. Passionate calls for accountability, change. The oldest and largest gunmaker in the US – Smith and Wesson – announced it would implement child-safety triggers, develop “smart guns” and a better system for background checks and other screening. And then…the NRA went to work. Boycotts, blackouts, PR nightmares. Within a year, Smith and Wesson had folded. The NRA – however – was stronger than ever. So really, nothing changed, except we began to learn the pattern – to brace ourselves for the next one, which would come too soon. Like many white women who grew up in small towns, I am not unfamiliar with guns – guns for hunting most especially have been around most my life. As an adult, I have gone a few times to a shooting range. My college boyfriend loved shooting, loved the feel of a weapon on his hands, the power. I didn’t love it, but I do still remember holding the gun. Cold, heavy. A little like holding the wheel of a car for the first time. Some people call it exhilarating. I couldn’t stop thinking about the flash of one moment – life, the next, death. No do-overs. No take-backs. As a religious tradition, we have never come to consensus about violence – when or if ever harming another – especially taking another’s life – is justified. In our history, you can find equal numbers of persuasive and impassioned pleas for pacifism and non-violence as there are assessments of the immorality of inaction in the face of broad acts of evil, especially towards the vulnerable and the marginalized. Many, like Theodore Parker, came to believe there is a time and a place to make the gun known, available, ready. In his case, there was a commitment for justice, and a real threat. The danger for himself and those he housed – it was not imaginary. And also it was not just self-defense. 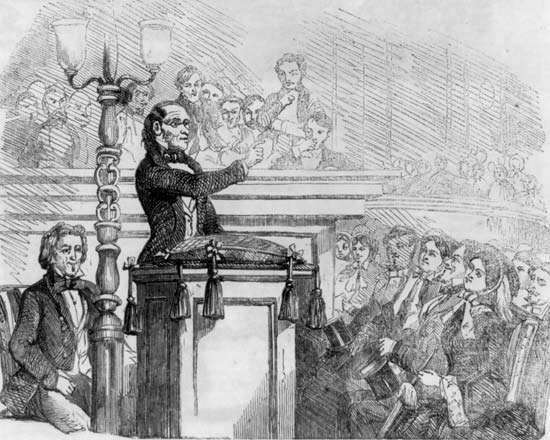 Because otherwise, he wouldn’t have brought it up in the meeting with his colleagues, the majority of whom had decided to cooperate with the Fugitive Slave Act. There’s a “pistol in my desk, loaded, ready for action.” It was a warning to them, and also a wish that they would join him, a call out that they had not. There is a kind of embedded moral judgment in a gun – a willingness to make a judgment – good/evil; right/wrong; live/die. A judgment made real singularly, impulsively, irrevocably. Parker never had to use his gun. It’s hard to know if he would’ve been able, or willing. Not everyone is capable of that sudden, urgent movement, to lift a gun, pull the trigger, hit the target, which is to say, another person. To take the life. No take-backs. Guns stop the possibility of redemption, stop the path of reconciliation, stop the potential of grace breaking through. Guns mean for clear endings, sometimes in the middle of everything. Just over a week ago marked the 10-year anniversary – of that day at the Tennessee Valley UU congregation – the congregation where Christopher’s step-father serves – when a man came in to where the service was happening, actually they were having a children’s play, so there were kids up front. He brought with him a 12 gauge semi-automatic, and a hatred for liberals and gay people. He opened fire, the adults tackled him. One man, an usher was killed, as well as a woman. Seven others were injured. Just like Columbine, so much came to an end that day, so much was lost. And also, some new things were born. The congregation in Knoxville was the original inspiration for the anthem we’ll sing at the end of the service today, what is now Answering the Call of Love. Their response after the shooting, especially their steadfast commitment to continue their advocacy for the GLBT community, and their continued spirit of welcome, despite all they’d been through, the ways they did not concede to fear inspired then-UUA president Bill Sinkford to say of them, this is the best of who we are. This spirit is Unitarian Universalism. For a while with Parkland, I played out the regular script, I confess, already anticipated the repeat. Sometimes it’s all too much to really take in. The script can actually feel helpful, to know it as a script, to keep some distance. But it didn’t take too many viral videos, before I realized, something else might be happening here. She is a high school student. Speaking to thousands. Holding space with tears running down her face. I could have equally shown you the video of 11 year old Naomi Wadler, who proclaimed she was there to represent the African American girls and women whose stories don’t make the newspaper, the victims of gun violence who are simply statistics. Or I could have invited some of our youth who are a part of this congregation, who helped with the walk outs here in Fort Collins that were one of 800 March for Our Lives events that happened across the country. Listen to these – to any of these youth speak, bearing witness to this – you realize that there is a movement happening here that is not just about school shootings – it is not just about one demographic or another. It is a movement that is asking us to deal with this story of guns, the things that guns are about that are about that is not just about guns: their place in our lives, our country, our stories, our identity. They are asking us because they know personally, that a gun is never just about a gun, it is about families, and children, race and gender, and economics and poverty – it is always, still about power. Who thinks they have it, who wants it. Who thinks they are vulnerable. Who doesn’t want to feel vulnerable. Kids Are Greater Than Guns. Of course I mean: their lives matter more than Guns, and we should do everything we can to live out that value – the value of the inherent worth and dignity of every single person – all ages. Maybe, we could start by studying and applying the lessons of what would really be effective in reducing gun violence. It would start by re-funding what was de-funded – because we aren’t even allowed to learn what would be effective in reducing gun violence. But that is not all I mean by Kids are Greater Than Guns – I mean I even more: our children and youth are more powerful than Guns, and the gun lobby. They have the capacity to change the role of guns as they relate to the idea of being America, and the idea of America itself. And as evidence, I offer the story that broke in the last couple days, about the NRA claiming financial struggles. And they specifically name the boycotts organized after Parkland. This is after all, the generation born in the wake of 9/11. That was 17 years ago, so they are turning 17 this year. Which means, they are nearly not kids, but more accurately, voters. This is the generation after all, where white people will in 2 years, be the minority. This is the generation capable of changing the American idea. In our church we say often that each person has a piece of the truth – and that truth continues to be revealed. Which is another way of saying, the story isn’t over. We’ve been playing out this script over and over – but something new is still being written. And it is our job, all of ours, to listen to this new story. To mentor these students, these children and youth, but also to follow them. To show up where they show to show up, to pay attention to issues they are raising, to be OK with the ways they are organizing that is not going to be the same way that other generations are organizing, and to believe – and to help them believe that they can lead us into the future that we have not yet been able to deliver for them, but that they are nonetheless prepared to seize. A Documentary History of Unitarian Universalism Vols. One and Two Dan McKanan, Editor., Especially in Vol 1 Theodore Parker’s speech to the May Meeting of Unitarian Ministers in 1851. This entry was posted in Justice, Sermons, Theology, Youth Ministry and tagged Grace, Gun Violence, Guns, Justice, Non-Violence, Non-Violent Resistance, Peace, Redemption, Sermon, Sermons, Theodore Parker, Theological Anthropology, Theology, Unitarian Universalism, Universalism. Bookmark the permalink.